—Gilbert Arenas has been charged with felony gun possession. Gilbert Arenas and his teammates making light of a felony weapons possession charge. Maybe he wears the number zero to advertise how many working brain cells he has in his head. The past two years he’s been in a competition with Yao Ming and Tracy McGrady to see who could miss the most time. I vividly remember saying and typing “PLEASE DON’T GET HURT AND MAKE ME LOOK LIKE A FOOL,” before drafting him in multiple fantasy basketball leagues. —Southern Indiana forward Jeron Lewis dies after suffering head injury during game against Kentucky Wesleyan. Lewis got tangled with another player during the game against KWC, and fell to the ground and hit his head on the floor. Less than an hour later, he was pronounced dead at Owensboro Mercy Health System. His team and coaches were unaware that Lewis had died and finished the game with a win. Thirty minutes after the game’s conclusion, his team and the staff found out that Lewis had died. Again, my thoughts and prayers go out to Lewis’ and the USI family. —Breaking news: David Cutliffe reportedly is the leading candidate for the UT football job. If you don’t know who Cutliffe is, you must not know college football. Cutliffe has a record of 53-44 in his eight years at the football powerhouse known as Duke University. Quite impressive. —Former Georgia guard hits game-winning shot against Lebron’s Cavs. I was watching this game live on TNT. Thankfully, I pushed through an extremely boring second and third quarter, where both teams combined for a painful 70 points. The fourth quarter was a gem. Lebron took over, scoring close to 20 points in the last 12 minutes, which helped put his Cavs ahead by two with 5.6 seconds left. The Jazz, who were without Deron Williams due to injury and Carlos Boozer, who had fouled out, pushed the ball up the floor and relied on rookie Sundiata Gaines to hit a fade away three-pointer as the horn sounded. Gaines, a former Georgia Bulldog, was called up from the NBA D-League on January 5th. Currently, he is on a 10-day contract. Something tells me he might get an extension. 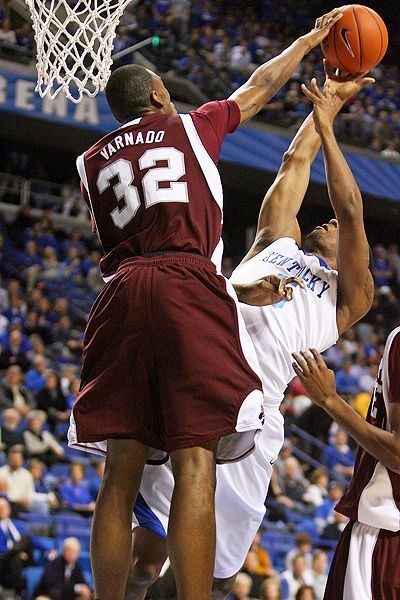 Varnado has 19 blocks in four career games against the Cats. He is 3-1 against UK all-time. —Jarvis Varnado records his second career triple-double and moves past Tim Duncan for third on all-time block list. Two SEC basketball headlines that didn’t involve Kentucky? Who said the South doesn’t know how to hit the hardwood. Varnado’s second career triple-double consisted of 17 points, 12 rebounds and 10 blocks. I’m very interested to see how DeMarcus Cousins, Daniel Orton and Patrick Patterson will play against the best shot blocker in the history of the SEC. —Marvin Harrison’s possible connection in shooting case being investigated. Before this story broke in July, I had Harrison as one of the nicest and most classy guys in pro sports. I’ve been wrong before, and looks like Harrison may prove me wrong again. 1942- FDR asks for baseball to continue during WWII despite many players enlisting and/or being drafted. 1993- Former Oklahoma State (formerly Oklahoma A&M), Henry Iba dies. Iba finished his 40-year career with 767 wins, including 655 at OSU. He won two national titles, and yet somehow OSU’s court is named after Eddie Sutton. Yes, the stadium is named after Iba, but he deserves the floor much more than Sutton. Randy White (1953)- former NFL tackle for the Dallas Cowboys. Delino DeShields (1969)- former MLB second baseman. Drew Brees (1979)- current QB of the New Orleans Saints. One of the saviors of the Saints football franchise. Matt Holliday (1980)- current OF for St. Louis Cardinals. Just signed a seven-year $120 million on January 7th. Not a bad early birthday present! —Lane Kiffin formally introduced as Trojans new coach. It will be interesting to see who stays at UT and who doesn’t. With signing day quickly approaching, it’s also unknown who will commit, decommit or stay put. I’m already a little tired of this story. If you thought Kiffin was always in the news when he was in the sleepy town of Knoxville, Tenn., it will be ten times worse in L.A.
Also, random question: What exactly has Ditchin’ Kiffin done to deserve two of the top jobs in college football? How can we tell if he’s a solid coach or not? He hasn’t been a head coach anywhere long enough to be judged. Reports have also said some Tennessee board members have contacted Phillip Fulmer to return. I can’t decide if this is arrogant or pathetic. Maybe a mix of both. All I know is if I was Fulmer I would still be laughing at anyone who asked me to come back to Tennessee. Stay away, Phil. Sit back, relax, enjoy retirement and sleep well knowing that Tennessee knows they made a mistake for running you out of Rocky Top. Nowtizki entered the 1998 NBA draft without going to college. If he hadn't entered his name, he was headed to the University of Kentucky. —Dirk Nowitzki becomes the first European-born player to score 20,000 points in the NBA. He’s a seven-footer that has completely changed the NBA. Backing down your opponent in the post is no longer good enough for a big man in the league. Now, thanks to Dirk, you have to have a J! The Mavs lost to the Lakers, even though Kobe Bryant barely cracked double-digits. Congrats, Dirk! —Clemson finally beats North Carolina. 10-game losing streak is over! The Heels were swamped from the start thanks to countless turnovers. Carolina drops to 12-5 on the year and should plummet in the rankings. This might be Roy’s worst year at UNC, which is understandable considering how much talent he lost the past couple of years. Player to watch: Trevor Booker of Clemson. He not only led all scores with 22, but shut down Ed Davis. —WLEX reports Morgan Newton to have precautionary MRI on throwing wrist. If you know me, you know I know a few things about wrist injuries. They don’t sound real serious, but I can assure you they aren’t fun, they can aggravate your whole arm. Hopefully this turns out to just be a sprain or something minor. —Blake Griffin to undergo season-ending surgery. The Clippers are cursed. This is proof. However, why did it take them close to three months to decide to operate on his knee? Get well, Blake. 1954- Joe DiMaggio marries Marilyn Monroe. Eight months later, Monroe filmed the famous scene in “The Seven Year Itch” where her dress blew above her knees. Strangely, DiMaggio wasn’t too crazy about that. 1987- James “Catfish” Hunter was inducted into the Baseball Hall of Fame. In case you were wondering, Catfish didn’t use steroids. But he did have a great mustache! It’s no secret that I am very tough on athletes that have used performance-enhancing drugs (PED’s). These athletes are cheaters and none of their numbers can be trusted. All the records they have broken still belong to those who didn’t cheat. After Mark McGwire recently admitted he used PED’s, ESPN asked all of their employees that have an actual HOF vote if they would vote Big Mac in. You’ve heard from the “experts.” So what do you think? Kiffin was previously at USC from 2001-2006 as a WR coach and offensive coordinator. —Lane Kiffin leaves Tennessee to coach at Southern California. I did not see this coming. Call me crazy, but I don’t know if hiring Kiffin is a great way to shush the talk of suspicious activity involving recruits. I can’t blame Kiffin, though. Knoxville or LA? In-state recruiting in Tennessee or California? SEC or Pac-10 schedule? Seems like an easy decision to me. By the way, whatever happened to the concept of a contract?! —The Cats stay perfect with a win in Gainesville, move to 17-0. Question: Who benefits the most from all the John Wall hype? Answer: Eric Bledsoe. He had a career-high 25 points Tuesday night against the Gators, 15 of them came in the first half. My disappointment of the game was definitely DeMarcus Cousins. He puts up somewhat solid numbers all year long, but he does not play like a man of his size should. He had 13 this game, but picked up too many stupid fouls and missed a few point-blank baskets. For all of you big guys out there, I’m begging you…PLEASE dunk the ball! PLEASE! For all of us short guys! —Mark McGwire is still a cheater. So is Jose Conseco. Long story short: Conseco says he and McGwire would inject together before games and McGwire says that’s not true. Then, they both seek your sympathy for what they’ve been through. Sorry guys, none here. Congrats to Roger Maris and his family! He now owns the record for most home runs in a single season. —Turner leads Buckeyes past Boilermakers. Evan Turner is the real deal…Purdue is not. Yeah, maybe Purdue will end the regular season in the top-10, but only because they may pad their record with some easy wins in the Big 10. Purdue doesn’t have the talent or offensive fire power to contend for a trip to Indianapolis. However, keep your eyes on the Buckeyes. If Evan Turner stays healthy and continues to produce, this team might be a sleeper for the Big 10 title and a surprise run in March. 1999- Michael Jordan announces his retirement. However, he returned in 2001. Reggie Brown (1981) of the Philadelphia Eagles. Welcome back! I hope everyone had a great Christmas break! To navigate to this daily article, you can click on a particular date on the calendar on the right side of the page. If any posts were done on that day they will show up. Also, you can click on the category named “Nate- Today in Sports.” Enjoy! 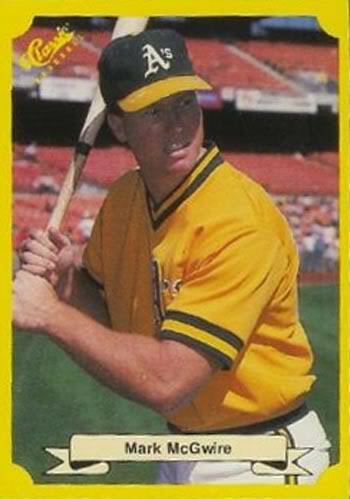 Mark McGwire his rookie year. Young, skinny and honest! —Mark McGwire finally admitted that he used steroids. He told the AP that he used steroids during 1998 when he hit 70 homers, which was a record at the time. It is huge news, but didn’t we all know that he took steroids? Why is it that once people admit something we all know they did, we somehow see them in a more positive light? Everyone knew he used steroids and/or other performance enhancing drugs. He, along with Sosa and Bonds were the more obvious users. Now we wait to see if he gets away with cheating and is voted into the Hall of Fame. Crazier things have happened: Al Gore got close to 51 million votes in the 2000 election. —Pete Carroll has been named the coach and vice president of football operations for the Seattle Seahawks. Carroll leaves USC after nine years with the Trojans. Carroll says it has nothing to do with the fishy activity that is being investigated at USC. Consider this claim Snuggie, because I ain’t buying it! But who am I to assume? Maybe he’s moving because enjoys cold rain instead of sunshine. —No. 4 Villanova beats Louisville in Freedom Hall. Scottie Reynolds had 36, Louisville blew a 17-point lead and Rick Pitino wore his all-white suit. All of this was unfortunate for Cards fans. This could have been the win that gets this Louisville team going this season. Instead, they played another game where they had more fouls than made field goals. I’m no James Naismith, but that’s not the way basketball is supposed to be played. —Cats take over No. 2 in the latest poll after Kansas loss to Tennessee. Texas and Kentucky remain the only unbeaten teams in the nation and move to the top of the charts after Kansas lost to Tennessee Sunday at Rocky Top. The loss is quite embarrassing for the Jayhawks considering Tennessee only has six scholarship players left on their roster. They also struggled with Cornell earlier in the week. It’s not time to press the panic button in Lawrence yet, but their Jayhawks have some work to do if they want to contend for a national title. I’m not too worried; they will figure it out during the Big 12 season. I realize that week 16 of the NFL season is probably the worst time to release a mock draft simply because you’re only a week away from getting the official first half of the draft order. That said, I would like to submit to you NFLMach1.0. Enjoy. Even though Ndamukong Suh is the most hyped pro prospect in recent memory, the Rams are in desperate need of a QB and could give Notre Dame’s golden boy the nod as the future face of the franchise. The Rams will have to hope this isn’t a pick that haunts them for the next decade or so. This guy doesn’t look like he could weigh 300 pounds and he looks more like a linebacker than a defensive lineman. The season’s most decorated defensive player will have to live up to larger than life expectations as he takes on the NFL. Lions fans will hope he pans out better than some of their previous first rounders. The Chiefs are a team that desperately need to get better along the offensive line. Okung is the best Tackle prospect in the draft. He excels in pass protection which is important as the Chiefs try to begin the transition to being a pass first team. If Ndamukong Suh is the next Warren Sapp, Eric Berry is the next Ed Reed. No other player in this class has the playmaking ability and versatility of Berry. There have been talks of moving him to corner, but he’s probably much better served as a ball hawking playmaker dropped deep. Would be the building block for the Bucs’ defensive return to glory. Many people expect the Redskins to go after a quarterback with this pick, but Jason Campbell has played great down the stretch and could re-sign with the team as he continues to develop. Adding Bryant would go a long way toward furthering Campbell’s development as it would add a true number one receiver to this subpar receiving corps. Very rarely are multiple safeties taken this early in the same draft, but this class is special. Mays could best be compared to Ronnie Lott of the 49ers dynasty of the 80’s. He’s the first player since Lott with the same blend of speed (4.35 forty) and hit power. Not a great ballhawk, but would surely help the Browns’ atrocious run defense. A team and a city seemingly stuck in mediocrity, Seattle actually looks as if they are starting to build a fairly solid defense. Aaron Curry was a great pick at linebacker last season and adding McCoy would make an immediate improvement to their run defense. The entire defense will greatly improve when Lofa Tatupu returns from injury next season. What good is the WR that everyone is projecting here if the Bills don’t have someone to get them the ball? Bradford’s stock will drop greatly due to the year long vacation he’s taking due to his shoulder injury, but if he can perform well in pre draft drills he can work his way back into the top half of the first round. The only player that might fit better here is Taylor Mays. Everyone who follows the draft realizes that Al Davis loves incredible athletes. Dunlap is just that. He has a few character problems, but that hasn’t stopped Davis in the past. The truth with this pick is, nobody knows what will happen here until Roger Goodell gets the card on draft day. If Brandon Marshall gets his wish and gets out of Denver, the Broncos will need to find a replacement. The speedy Tate is nothing like the big target Marshall, but his playmaking skills are unquestionable. With the best inside linebacker in football in Patrick Willis, a speedy pass rushing ‘backer in Manny Lawson, and a Hall of Fame former linebacker as Head Coach in Mike Singletary, theres no reason McClain shouldn’t be added to this already incredibly talented 3-4 defense. How far would you go to save your franchise? It seems like the Jaguars’ management is going to have to reach down and draft the beloved Tebow to garner enough fan support to keep the franchise in Jacksonville. Now the question is… Will Tebow get a shot at quarterback? As bad as the Titans began the season, they’ve been outstanding down the stretch. This team doesn’t have very many weaknesses, but adding a great athlete to an aging defensive line couldn’t hurt. Through recent draft history, Georgia Tech is becoming “D-End U” (I tried). I realize it looks ridiculous to have two defensive players from the same school being drafted by the same team within four picks of each other, but is there a better fit? Cody is absolutely HUGE (6’5”, 365) and would be a steal nose tackle for a 3-4 defense this late in the draft. Coach Singletary should be very satisfied with his defense, and the rest of the NFC West should fear it, for many years to come. Hughes has been the anchor for a terrific Horned Frogs defense all season. The Dolphins just may be willing to give him a chance to prove he can do the same in the NFL. Will have to transition to an outside linebacker in Miami’s 3-4 scheme. Davis will compete with Okung for being the top tackle off the board. The junior has dominated Big East defenders all year and would possibly be a top 5 pick if he stayed for his senior year. His stock will greatly depend on how he performs in workouts. A playmaking corner that knows what it takes to win, Haden is just the type of player the Falcons need to improve their secondary. Haden has great upside and there’s really no telling how good he can be. The Texans have plenty of serviceable running backs on their roster, but it doesn’t seem like any of them can hold onto the football. Spiller is electrifying and could be the next Reggie Bush (though he aspires to be more like Chris Johnson). Spiller is a steal in the second half of the first round and fits the Texans’ system perfectly. The Derrick Mason premature retiring scare last offseason showed how reliable the Ravens are on their veteran receiver. Benn could be the future solution for this team. This organization has been brilliant in recent drafts so whatever direction they decide to go here, their fans should have faith that management knows exactly what they’re doing. Rex Ryan has already made his defensive mark in New York and it’s likely that he only wants to further his defense’s talent. The Jets don’t have many weaknesses, they just need time to develop. Forgive me for any lame joke made about his name. The Seahawks running game has actually done a decent job this season being as injury plagued and under talented as they are. Best was a serious Heisman contender before an injury ruined his season. If he can prove he still has the skills that made him so great in college, he will have a good chance of coming off the board in the first round. Jahvid could be Seattle’s “Best” chance to salvage their offense. The Giants have no glaring needs other than gaining some consistency, but there’s no single player in the draft that can step in and fix that issue for them, so here they may look towards a very hot defender in Dan Williams. He has really stepped it up towards the end of the season for the Vols and in doing so could have worked his way into the first round. A monster of a run blocker, Iupati is a perfect fit for the Packers. It’s true that this is a team that struggled in protecting Aaron Rodgers so the first thought would be to invest in a franchise left tackle. The problem there is that the best tackles will be off the board at this point. Also, the offensive line really stepped it up and have done a much better job in pass protection late in the season. Spikes is a very talented linebacker that can play in any system. He could really give this defense a face and a true identity which they lack. Standouts like Carlos Dansby, Antrel Rolle and Dominique Rodgers-Cromartie have given the defense life, but they’re still not household names just yet. Spikes can change that for this team. There has been a lot of talk about how terrible the Bengals tight ends are, but the truth is they’ve really just been plagued by injuries all year. Still, Gresham is a playmaker at the tight end spot and could be a weapon that Carson Palmer and company could implement into this already efficient offense. Dallas doesn’t really have any glaring needs and have shown how dangerous they can be late in this NFL season. The Cowboys’ best bet here would be to go after a DE that can play in their 3-4 system. The large and powerful Wootton would fit perfectly and make ‘Boys fans forget about Marcus Spears. Trading Richard Seymour just before the season started shocked everyone. Although Austin doesn’t play the same position, he can still be added to the line as they transition to a younger group. Theres no way of knowing what Bill Belicheck will do here as his picks are almost always a surprise. The best 4-3 outside linebacker in this class, Weatherspoon will have to be groomed into his starting role. He has quietly been one of the best linebackers in college football for the past two seasons and will finally reap the benefits this offseason. The Brett Favre saga can only last so long. Colt McCoy is a hard worker and a good kid. He is the type of player that would look at sitting behind Favre as a great learning opportunity and can eventually continue his college success in the pro game. Quinton Jammer is aging and the Chargers will need a replacement to play alongside Antonio Cromartie. Who better to play beside him than fellow Seminole Patrick Robinson. Early in the season there were concerns about his speed, but watching him play this season it is hard to imagine why. Wherever he goes, his new team will be pleased with what they get. Early in the season, if you told anyone that a South Florida defensive end was going to be taken in the first round, they would have almost definitely thought of George Selvie. Instead, this physical freak has almost guaranteed his place in the first round. He may be long gone by this pick, but I’m a bit timid to have him too high just because of how little time he has spent on draft boards. A team that receives more publicity for a loss than most teams receive for a win obviously doesn’t have too many weaknesses, but adding depth to a defensive line that has struggled against the run can only help your cause. Florida football coach Urban Meyer has just announced he is stepping down from his current position. He released a statement saying that he needs to focus on his health and family. Meyer is 45 years old and just signed a six-year contract extension in August 2009 worth $24 million. The Sugar Bowl will be his last game at Florida. I’d like to wish everyone a very merry Christmas and happy New Year. Thanks again for your support throughout the year! 2009 was great! I’m not sure how much I will be able to post during the next couple of weeks. I will be in Pensacola, Fla. and New Orleans until January 5. Please travel safely over the break, and I hope all of your favorite teams come out on top! When I get back, I am going to try and do a “Today in Sports” post daily. Thanks again for your support! This 10-0 start is the best in the Lady Cats history. The previous best was 9-0 by the 1980-81 team that finished 25-6. Whoa. The Tennessee Lady Volunteers lose at Stanford, 67-52. I wouldn’t read too much into this first loss as the Lady Vols still have 6-foot-6 Kelly Cain and a coach named Pat Summit. I know a lot of people might disagree, but Pat Summit is one of the best coaches to ever lace-up a pair of basketball sneakers, male or female. Giddy-Up. The red-hot San Diego Chargers win their ninth straight game against the Cincinnati Bengals, 27-24. Nate Kaeding nailed a 52-yard field goal with three seconds left to win the game. Coupled with the Denver Bronco’s 20-19 loss to the Oakland Raiders, the Chargers have won their fourth consecutive AFC West crown. San Diego is now 11-3 after a 2-3 start. Whoa. The San Diego Chargers have won 17 consecutive December games. 17! This streak goes back to the last game of the 2005 regular season. Absolutely amazing! If Norm Turner could win games in January as well as he wins in December, he would have Super Bowl rings on every finger of one hand. Giddy-Up. The UK men’s basketball team won its 2,000th victory beating Drexel, 88-44. It was the best all-round performance of a young Wildcat team this year. Lead by DeMarcus Cousin’s 18 point-13 rebounds (in only 14 minutes), Patrick Patterson’s 18 points, and John Wall’s 16 points-7 assists the Cats built a double-digit lead in the first four minutes and never looked back. This allowed John Calipari to empty his bench with 9 minutes left in the game. 2,000 wins are sweet, the continuing improvement of this Wildcat team is icing on the cake. Whoa. Kentucky won its first game in Febuary in the year 1903. Sixty-six years later, Kentucky got win 1,000 in Jan. 1969 against Tennessee. It only took 40 more years to get to No. 2,000. In second place is North Carolina with 1992. There was a great concern within the Wildcat Nation that UNC would catch Kentucky. The Tarheels had made a run at the milestone in the last two years, picking up 30 wins on Kentucky during the tenure of Billy Gillispie. I have no idea where Billy is today, I’m just glad he’s anywhere else. Giddy-Up. The Dallas Cowboys knock the New Orleans Saints out of the unbeaten ranks with a 24-17 win in the Superdome on Saturday. The Saints have had several miracle last-minute wins over the past few weeks but ran into a Dallas team playing the most complete game of their season. Dallas controlled both sides of the ball during the first three-quarters, built a 24-3 lead and held off a feverish Saints rally in the last quarter to win, 24-17. Whoa. I admire the relationship the Saints and the people of New Orleans have developed after Katrina destroyed this Grand Old City. The entire team has talked openly of their desire to win games for their fans and how it has uplifted the spirits of their community. This has to put more pressure on the team whether they realize it or not. A loss to the Cowboys without Reggie Bush and Jeremy Shockey might release some of that pressure. No one likes to lose this late in the season, but a Saints team focused entirely on wining should go deep into this year’s play-offs. Giddy-Up. The Pittsburg Steelers beat the Green Bay Packers on a last second touchdown. The Tennessee Titans beat the Miami Dolphins in overtime. The Atlanta Falcons beat the New York Jets with a TD on fourth down inside of two minutes left in the game. The San Diego Chargers beat the Cincinnati Bengals with a field goal in the last seconds. The Arizona Cardinals blow a 17-point lead and then score a TD with less than two minutes left to beat the Detroit Lions. The Oakland Raiders beat the Denver Broncos on a TD with 35 seconds left in the game. Whoa. Week 15 of the NFL season had its fair share of nail-biters. Seven last-minute wins may or may not be a record, but it points to my theory that the NFL has more teams that get better as the season progresses than any other professional sport. True, some teams don’t, but at this point of the season, no win is guaranteed. Here’s this year’s bowl schedule. It includes time, place and TV schedule.